UPDATE: There were a few other rules to Japan’s Trusted Traveler program that I was not aware of. The information has been reflected in this updated post. Welcome to the first post of 2017 on the Japan Tips blog. My thanks once again to those who have supported this page and I hope that your year will be full of happiness, good cheer… and maybe a trip to Japan! Long time followers to this blog know that I do not answer questions about Japanese immigration (see the disclaimer) but for this post I will address one immigration topic that has come to light in recent months – and may just very well be a good thing for those looking to bypass immigration queues more quickly at the airport. A few months ago, Japan started a Trusted Traveler Program. Like several other countries, including the United States, the purpose of the Trusted Traveler Program is to allow pre-screened, low-risk travelers the opportunity to bypass the lines for immigration and/or customs counters at certain ports of entry by allowing them to use computer kiosks. These kiosks will typically take your photo, scan your fingerprints and allow you to answer immigration/customs declaration questions before allowing you to proceed. I signed up for the US’ version of Trusted Traveler, Global Entry, in 2014. It’s probably the best $100 spent… since not only can I use kiosks entering the US, I also can get expedited security screening via TSA PreCheck. 1) You must have visited Japan twice in the last 12 months, have not been deported from Japan, are visiting from a country where a visa to enter Japan is not required, and will be visiting for short-term business, sightseeing, or to visit relatives. 2) You must also prove that you work for a large business, or visit on business related to the Japanese government or a Japanese business. If you are a United States citizen and are already enrolled in the US Trusted Traveler Program “Global Entry” then the business requirement (#2 above) is waived. To sign up for the program, you must first go to the website for Japanese Immigration to submit an application. There are two steps: The first occurs during the online registration process. Once your online registration is approved, you then have three months to fly to Japan and complete an in-person interview with an immigration official who will take your photograph and fingerprints. The interview is done after you have cleared landing formalities, so you will have to go through the standard immigration queues. During the interview you will have to pay a fee of 2,200 yen (About $20 USD with the current exchange rate). When the interview is completed, you will receive a registered user card that will allow you to use the automated gates wherever they are available – currently Narita and Haneda airports in the Tokyo area, Chubu Centrair airport in the Nagoya area, and Kansai airport in the Osaka area. The card is valid for either three years or until the expiration of your passport, whichever is shorter. Note that this automated gates only cover the immigration portion of the arrival procedures. Customs, from my understanding, is a different story and you will need to go through those channels in the usual way. This sounds like an excellent program to take advantage of, especially for those who already have Global Entry. However, as a Global Entry member I am still required to visit Japan at least twice a year before I receive the card, so this program would not be of good use to me. For those who make trips to Japan on a regular basis for business, pleasure or family, Japan’s Trusted Traveler Program may be a wise investment. HT to Brad on Travel Codex for his post on the topic today. Today I have updated the disclaimer on my blog. As has been the case since I started the blog around 6 years ago, any information provided on this site, and any advice that I am happy to provide, is to be used at your own risk. Please note that the disclaimer now addresses immigration questions. Immigration is a very important topic when visiting Japan, or any other country for that matter. Due to the varied nature of this topic, I have decided that going forward I will not answer specific questions regarding immigration in Japan. This includes immigration status, visas, etc. Any specific immigration questions will be best answered by your local Japanese embassy or consulate. Thanks for your understanding, and thanks for supporting my blog! 6/30/2018 Update: This post has turned into the most popular post on my blog thus far. I would like to clarify that the post provides basic guidance on the flow of arrival procedures when arriving in Japan. Please note that this blog does not offer advice or answers on detailed questions concerning immigration status, visas, etc. It is my policy NOT to address these questions, which are best answered by your local Japanese embassy or consulate. Also please note that the arrival procedures have changed a little since this post was written. 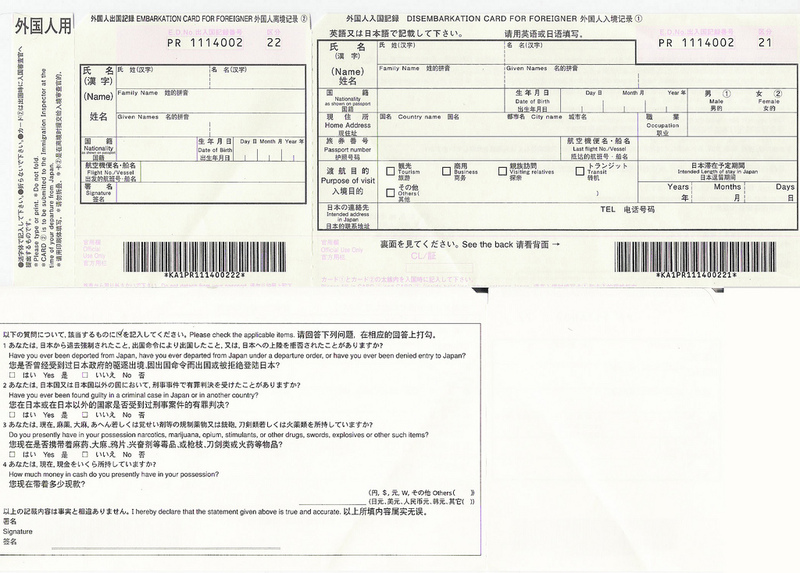 When you arrive in Japan, you will now receive a DISEMBARKATION FORM ONLY. An embarkation form is no longer required when leaving the country. Today I wanted to offer a brief overview of what you can expect when you land in Japan, mostly in the form of customs and immigration procedures. No matter what International airport you land at in Japan, the arrival procedures will be the same. This applies for all foreign visitors to Japan. Of course, you will want to ensure that you do not need a visa to enter the country, and for many travelers this is the case. Those coming from 66 countries, including the US, Canada, United Kingdom, Australia, New Zealand and the European Union countries can stay visa free in Japan for up to 15, 30 or 90 days. The law states that the visa period is the “shortest period long enough to cover the purpose of stay of the foreign national”… though in my three trips to Japan, each of which were two weeks in duration, I was given 90 days every time. Any stay over 90 days will require some sort of visa application beforehand. Prior to landing, the flight attendants on your flight will hand out two (possibly three) forms to fill out. One is the Embarkation/Disembarkation Card, a rectangular document with a detachment in the middle. This form is for the immigration authorities. Another is the Declaration Form for Japanese customs authorities that has the words “Customs Declaration” at the top. Some travelers on certain flights, or arriving from certain countries, must also fill out a yellow Quarantine Form from the Ministry of Health and submit it upon arrival. In this article, I’ll just write about the first two in this article. Once you step out of the airplane, you will walk down the designated corridor to begin the immigration procedures. Along the way, you will pass an international connection counter. If you are connecting through the airport to another international flight, you would check in here and then go to security to connect to your international flight. Most people arriving in Japan, though, will proceed to the immigration/customs procedures directly. There have been a few instances in the past where those transferring to domestic flights at certain airports would go through the International connection counter to connect to the domestic flight – in those instances, their domestic flights would be considered “international”. For example, if memory serves me right Japan Airlines used to have connecting flights from Narita in Tokyo to Nagoya designated for international passengers…. in which case, customs procedures would be carried out in Nagoya, not Tokyo. These days, though, I don’t think they exist, so if you are connecting to any domestic flight you will have to go through immigration/customs at your first airport. Now let’s look at the embarkation/disembarkation card. It’s a pretty straightforward form to fill out, but I’ll go over the key points. First, there is ONE FORM PER PASSENGER, so each person fills out their own card. You should NOT detach the form yourself. Immigration authorities will detach and keep the “disembarkation” part, and staple the “embarkation” part to your passport. The “embarkation” part is collected by immigration when you depart Japan. Your NAME on the form is written in the form of Last Name, then any Given Names. DATE OF BIRTH is written down on this form as DAY, MONTH, YEAR. So, March 1, 1980 would be written 01/03/80. LAST FLIGHT NO./VESSEL should be the airline flight that you are flying into Japan on. So if you were, for example, flying in on United Airlines Flight 79 from Newark, NJ, you would write in United 79 or UA 79 (the two-letter designation for United). INTENDED ADDRESS IN JAPAN should be the location of your first place of lodging. So it should be the name of your first hotel, or the address of where you are staying if it’s a residence. On the back, you will have to answer some immigration questions – including the amount of cash in your possession upon landing – and sign the form. You can fill out the “embarkation” part right away, if you wish, with the flight you plan to leave Japan on. It’s probably best to fill this out at the same time as “disembarkation” so as to not worry about it later. As stated before, the “embarkation” part will be collected by immigration when you depart. Now let’s move on to the Customs Form. A direct link to the customs form can be found here, on the Japan Customs site. There is ONE CUSTOMS FORM PER FAMILY, so if you have a family of three on the trip you only have to fill out one form for everybody. At the top of the form, you’re asked again for your Flight number/vessel, and also for your point of embarkation. This is the city from which your flight to Japan departed. So, if you were on United Flight 79, for example, you would write in Newark in this section. Read both sides of the customs form and answer the questions. Pay close attention to the duty-free allowances. If you are carrying anything in excess of the duty-free allowance you have to declare it. Now let’s review the procedures for arrival. First up is QUARANTINE. Most passengers will just walk through Quarantine, but if you were given a yellow quarantine form to fill out you should surrender it here. Next to the Quarantine Area is a Health Consultation Room. You should check in here if you think you feel ill or sick upon arrival – you can be checked out by a doctor here. A few years back, passengers from North America had to fill out quarantine forms during the H1N1 epidemic. Next up is IMMIGRATION, where you will go to the line for foreigners and turn in your passport and the filled out embarkation/disembarkation card. Only one person at a time should visit the immigration officer. The officer will take a photo of you, and scan your index fingers from both hands. This is part of recently-introduced anti-terrorism laws, and a growing number of countries – including the United States – are instituting these procedures for foreigners. After that you will claim your baggage and go to CUSTOMS. As in many countries, there is a Green Channel and a Red Channel. If you have nothing to declare, go to the green channel. If you have items to declare or are not sure, go to the red channel. In any case, you will present your passport and the customs declaration form to the officer, who will conduct an interview with you on the spot with questions such as “Where are you from”, “How long are you visiting”, and “Do you have anything to declare.” One time, a female customs officer at Narita kept me for a few minutes asking about my precise itinerary… “So you will take the shinkansen on this date to go to Osaka?” , etc. If you have any duties to pay, you have to pay them to the cashier next to customs before leaving. Also, Japanese airports have quarantine stations for plants and animals, including pets and meat products. You will have check in at one of these stations before proceeding through the main customs area. If bringing animals, you will have to make arrangements in advance with Japanese Customs – though many visitors, of course, should not bring their pets unless they are intending to stay for quite a while. Congratulations, you have completed the arrival procedures! That means it’s time to either connect to your domestic flight or move on to your first destination in the Japanese city that you are arriving at. I will probably tackle some arrival tips in future posts. In the meantime, here are a few more sources of information to look at concerning Arrival and Departure procedures in Japan. Japan Airlines has a page with the videos shown to their arriving passengers at Tokyo Narita, Osaka Kansai and Nagoya airports. Disclaimer: Please note that this blog does not offer advice or answers on detailed questions concerning immigration status, visas, etc. It is my policy NOT to address these questions, which are best answered by your local Japanese embassy or consulate. Thank you.